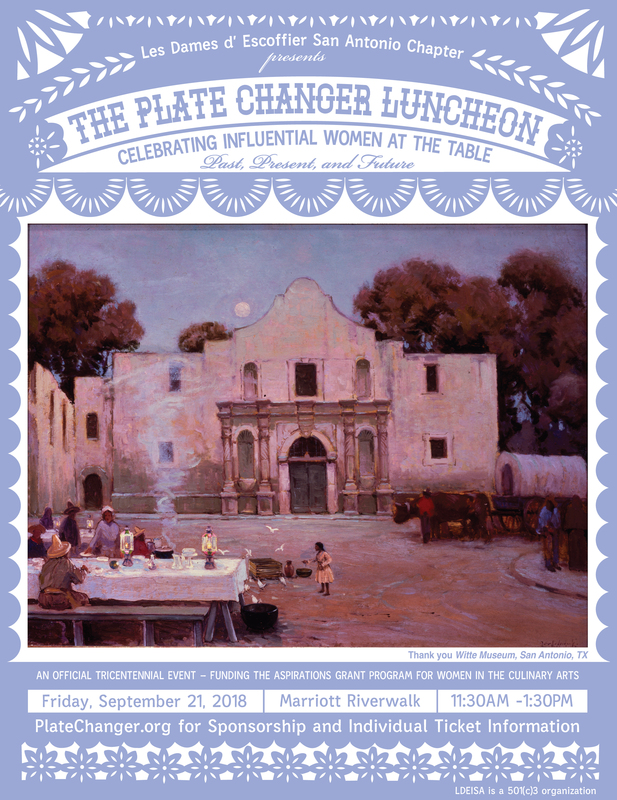 Join Les Dames d’Escoffier San Antonio Chapter for a delicious, enlightening journey celebrating Influential Women of the Table this Tricentennial year. Discover flavors and tastemakers of the past, present and future as we showcase ingredients and dishes that contributed to our fair city’s status as a UNESCO Creative City of Gastronomy, from the Chili Queens who graced Plaza de Armas in the late 1800s to the innovators that make San Antonio the epicenter of culinary arts in Texas today. From Tex-Mex to Tex-Next, this luncheon is an official Tricentennial event that benefits the Les Dames’ Aspirations Grant program. The Aspirations Grant program, started in 2015, has already awarded $85,000 to local culinary professionals and farmers. In 2018, the program awarded a total of $35,000 to seven women-owned restaurants and caterers from Rockport and Port Aransas affected by Hurricane Harvey. To empower and further business enhancement or culinary innovation. The Plate Changer Luncheon is a fundraiser hosted every other year to raise funds for the Aspiration Grant.